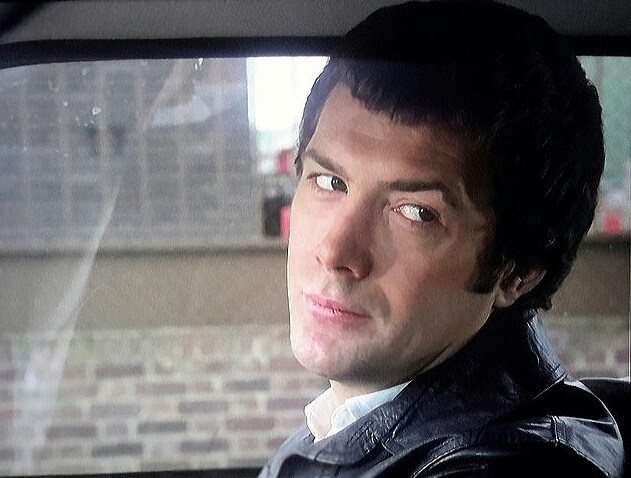 #388......"LEWIS COLLINS" - BODIE 3.7 . you'll never walk alone ! Brilliant capture of a wonderful expression! You know, you're really doing a great job in spotting them. Thank you! Thankyou, i have a huge amount of screencaps in my gallery and i am trying to sort through them, it's lovely to go through them and remember what has actually been captured, i love this look that he gives to Doyle even if you have to visage Doyle on the receiving end. thankyou, i'm glad you are still enjoying the view. Well, Bodie is having none of that, LOL. ha ha, it's a look of "what if" and Doyle will probably just shrug his shoulders and agree with him. What a great picture. That's such a good Bodie expression. Thanks. Thankyou, i love his expression here and i can only imagine what Doyle must be thinking. When this popped up, I couldn't help thinking of Theresa May, the picture of her in front of the bricks, I think, given the choice, this is a far better choice! Bodie, the pm, i know which one i would choose though the prime minister is not high on my agenda so i'm not sure of the pic that you mention. Ahh yes the gorgeous black leather jacket and white shirt combination....works a treat. ha ha, best place for her, up a chimney *g* .....cheers for that. beautiful isn't it and thankyou so much for looking at it. i agree and i must admit to Doyle being very lucky to be on the receiving end of that look. Great capture and we just know Doyle is looking right back at him. I can really hear him say "Oh, come on Ray. It will be fun!" Great picture.